Hello, everyone! I hope you all had a great Halloween! We had a good time. There were more lights on than the past couple years. One crazy difference this year was all of the teenagers trick-or-treating! Usually there would be about 2 groups wandering about town, but last night it was like the entire high school was out. Good for them, lol! Get all the candies while you can! I have my second Halloween mani to show you guys. Recently POP Polish came out with pastel multichromes and they are amazing! 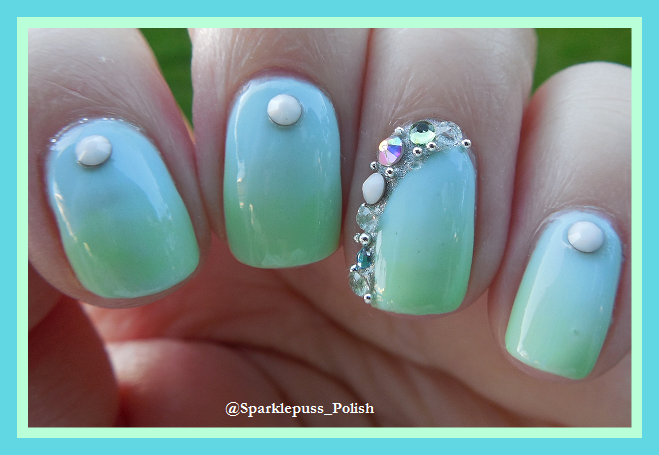 This gorgeous polish shifts between green, gold, and aqua. Unfortunately, I could not capture the aqua shift. It’s opaque in 2 coats and has a great formula. I had zero issues! For these nails I used Funky Fingers Dark Night, which is a fantastic black polish. I used plate BP-L057 from Born Pretty. I think these turned out pretty cute. They’re basic, but fun! Love those ghosts! Was quite where I live, no trick or treaters! That is such a unique polish. I love it! That’s a really pretty base! I haven’t tried POP yet but look forward to doing so. The ghosts look happy! How cute!